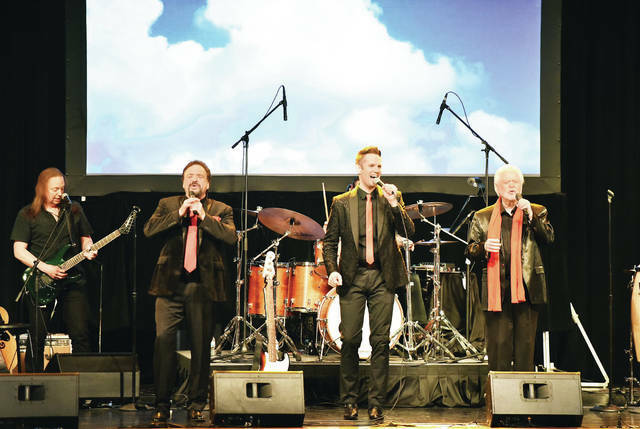 The Osmond Brothers perform during the Gateway Arts Council’s final concert in the 2018-19 Presents Series at the Sidney High School auditorium Saturday, April 13. 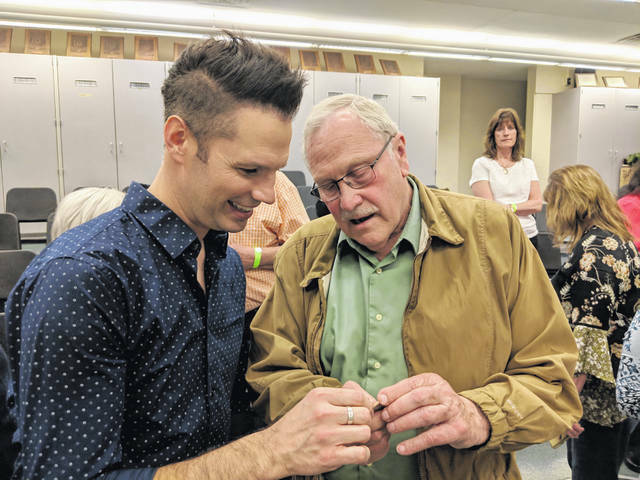 David Osmond and Shelby County Sheriff John Lenhart look at the Shelby County Bicentennial wooden nickel which Lenhart gave to Osmond during Saturday’s meet-and-greet following the Osmond Brothers concert. SIDNEY — Two generations of Osmonds wowed a sold-out crowd during Saturday’s Gateway Arts Council’s Presents Series final performance of the year. Original members of the Osmond Brothers — Merrill and Jay — were joined by their nephew, David Osmond, on stage. David is the son of Alan Osmond, who was also one of the original four performing Osmonds. The Osmond Brothers — Alan, Wayne, Merrill and Jay — got their start in 1957, when they began performing to raise money to buy their oldest brothers, Tom and Virl, hearing aides. They were “discovered” in 1962 at Disneyland by Walt Disney. “We never thought we’d be around almost 62 years later,” both Jay and Merrill told the crowd. They shared stories about their career — including how Merrill was mistaken for country singer Kenny Rogers at an airport. David said he thought all fathers were in the entertainment field while he was growing up. He also shared that his father, Alan, is battling multiple sclerosis, a disease that David has also been diagnosed with. “My dad says ‘I may have MS, but MS doesn’t have me,’” said David. During their concert, the Osmonds paid tribute to Elvis and Neil Diamond, who said he always wanted to be a member of the Osmonds singing group. While they performed their songs, videos of the same song performed by the five-member Osmond Brothers were depicted. Jay said he and his brothers have admired many singers during their career. Jay was asked if there was a possibility Donny or Marie Osmond could join their brothers in concert after the brother-and-sister duo ends their stay in Las Vegas in November. “You never know what will happen in the future,” said Jay. The launching pad of their career came after Andy Williams saw their performance and invited them onto his TV show. Younger brother, Donny, joined the group and the Osmond Brothers were off and performing. The Osmonds have produced 47 gold and platinum records. They produced a record 11 gold and platinum awards in one year, a feat that hasn’t been matched. In 2003, they receeoved a star on the Hollywood Walk of Fame.